Distribution: Endemic to California, the delta tule pea is found mainly in the Sacramento”“San Joaquin Delta and has been documented in Contra Costa, Sacramento, San Joaquin, Solano, Napa, and Alameda Counties. The closest known occurrence is approximately 20 miles (32 kilometers) south of the Natomas Basin in Walnut Grove. 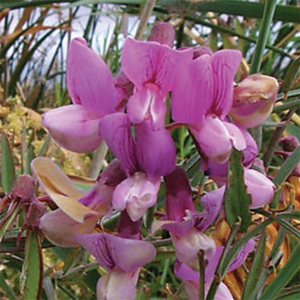 Habitat Requirements: The delta tule pea is generally found on brackish and freshwater marsh and slough edges. It can take root in appropriate habitat and climb to neighboring upland and riparian areas. Associate species include the California wildrose (Rosa californica), cattails (Typha spp. ), and the common tule (Scirpus acutus). Demography: The delta tule pea is a perennial herb with a vine-like habit in the pea family (Fabaceae). It depends on a cycle of flooded and dry periods in freshwater or brackish wetlands. It generally grows along the edges of riparian wetlands, sloughs, marshes, and swamps and blooms showy pink flowers from May through July and, in some years, as late as September.